kitchen cupboard Knobs, kitchen cabinet drawer knob handles, Bar Knobs Pull，bathroom cabinet door or drawer pull Knobs, desk drawer pull Knobs, armoire door or drawer Knobs. The Knobs uses high-precision aluminum alloy with high stability and there is a layer of purified film on the metal surface which can resist the corrosion of the atmosphere, alkali and acid. The thread is deep in the screw hole with fine workmanship, and the thread in the flat screw is clear with tight occlusion, without any loosening aftre long-term availability. The Knobs are all made of authentic materials by solid integrated casting, which are sturdy and durable and almost unbreakable with much longer service life. The knobs/handles are manufactured by five-layer nano-vacuum plating process, without excessive formaldehyde and excessive heavy metals, which meet the international environmental standards. The surface treatment adopts matte processing, which is simple and elegant, clear and free of impurities, with soft texture and durable color. The classic black style with all-match fashion adapts to various styles of cabinet doors (such as furniture doors, cabinets, desk drawers, wardrobe drawers, shoe cabinets, bookcases, etc. ), which is simple with high quality and level. 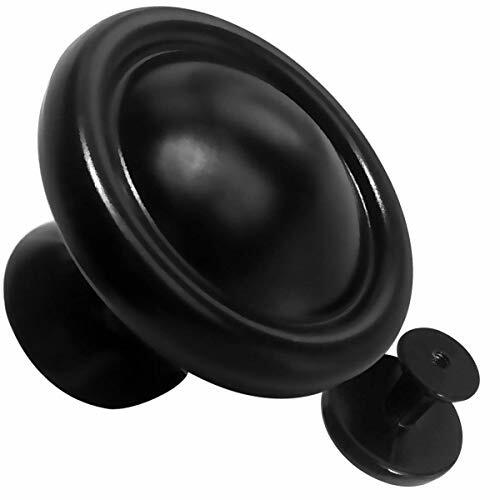 ✔️ Black modern high quality Kitchen Cabinet Hardware: kitchen cabinet Knobs Diameter is 1.2 inches, Height 1.02 inches, These Kitchen Cabinet Knobs are high quality heavy duty. ✔️This black kitchen cabinet door Knobs set is durable and great quality, with a very sleek and luxurious design that will give your kitchen a new modern look. The solid neutral black color will match almost any color or type of cabinet. ✔️This pull knobs set can be used for kitchen cabinet door knobs, Bar knobs Pull,dresser drawer knobs,knobs for furniture,bathroom cabinet knobs, or as desk drawer knobs as well. ✔️The aluminum alloy finish gives these cabinet pulls durability in the scenario of constant opening and closing of cabinets and drawer doors. ✔️Each piece in this cabinet knobs set comes individually polybagged to avoid scratching during shipment. Each cabinet pull handle comes with 2 sets of mounting screws (1 inch and 1.5 inches) included in the set. You will only need 1 screws for each cabinet handle, but depending on the thickness of your cabinet door or drawer use whichever set works best. If you have any questions about this product by JAYONG, contact us by completing and submitting the form below. If you are looking for a specif part number, please include it with your message.